Public information polls in the United States are almost always extremely depressing to read, particularly considering our prosperity and capacity to access knowledge. Large segments of the American population are terrifyingly ignorant of basic facts. A study by the National Science Foundation concluded that 26% of Americans think that the sun revolves around the earth. Gallup has found that 42% of Americans believe in young-earth, biblical creationism. A recent Ipsos poll found that the average perceived unemployment rate was 32% (more than five times larger than the actual unemployment rate at the time). This ignorance extends to a wide range of scientific, civic, and economic facts and is a major issue in a nation that ostensibly relies upon an informed public to elect its leaders. If the American public is so ignorant, how can they be expected to rationally advocate for their interests at the ballot box (and how can we be surprised when a bunch of lunatics and fools are elected)? While the “average” American is ignorant, self-identifying Republican primary voters are absolutely terrifying in their ignorance. On virtually every issue of politics and science, GOP base voters fall below the national average (which includes them, this is skewed) for knowledge. 57% of the Republican base supports establishing Christianity as the official religion of the United States while only 30% oppose turning the US into a theocracy. 66% of the Republican base actively rejects the reality of global warming while only 27% accept it (as opposed to 50% of the general population). 49% of the Republican base doesn’t believe in evolution while only 37% do (as opposed to 42% of the general population). 54% of the Republican base believes that president Obama is a secret Muslim (compared with 26% of independents and 10% of Democrats). This polling information is further backed up by the following graph, created using Gallup and US Census data, representing a comparison between higher education and partisan affiliation. 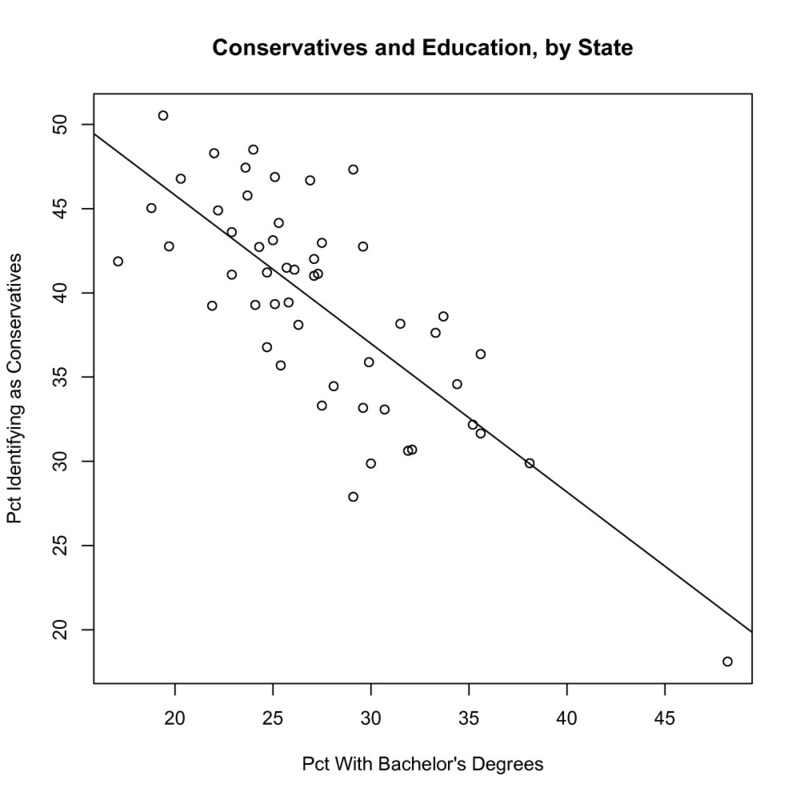 In short, the more educated the population of a state is (in aggregate) the less likely it is that residents of that state hold conservative views (ex. New England is highly educated and very liberal, while the Deep South is poorly educated and very conservative). In some ways, such results aren’t surprising, as polls have shown that the Republican base is almost exclusively reliant upon a very small subset of news sources, primary of which is Fox News (nearly half of conservatives use Fox as their exclusive news outlet). This is important because, while popular, has been shown as the least accurate news outlet in the USA and people who watch Fox News are actually less informed than those who watch no news at all. Unfortunately, ignorant people tend to suffer from an intellectual bias called the Dunning-Kruger effect, where they dramatically over-estimate their own knowledge/competence and will express their ignorance with extreme confidence. In short, they are too ignorant to know that they are ignorant, thus have deluded themselves into thinking that they know more than others. Ironically, the inverse of this effect is also observed, where more knowledgeable individuals tend to underestimate their own information and provide conservative estimates for their own relative competence. 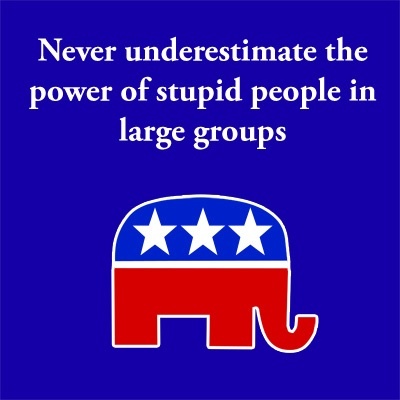 The modern Republican Party is a case study in what happens when a mass of unusually ignorant people groups together under a banner of Dunning-Kruger inspired imagined competence and tries to take over the country. These people are funded and directed by wealthy and knowledgeable individuals who have an economic incentive to steer the nation towards the non-factual delusion of the base. This coalition elects people who reflect their opinions and share their cognitive bias, causing immense disruption in our politics (ex. a senator bringing a snowball into the Senate chamber in order to “disprove” climate change, in defiance of 97% of relevant scientists). While I don’t expect, or even want, EVERY American to suddenly become a progressive, our nation needs to start basing its decisions upon reality. Americans, but most of all conservatives, need to use all of their resources to seek out accurate information and to stop believing in the pervasive falsehoods that have polluted our public consciousness. Until this happens, a large portion of our nation will continue to live in a fact-free bubble and draw the rest of us into a series of internationally embarrassing and pointless debates over things that they simply don’t understand. Excellent post, as usual. When referring to evolution (or to global warming,) I would not phrase it the way pollsters often do, as a belief, ie, do you believe in evolution. That plays into the right-wing argument of evolution as a belief system. It’s not. It’s science. The question regarding evolution should be, have you looked at the evidence, and if you have, are you convinced or not convinced. (And if you haven’t looked, why not, and if you’ve looked and are unconvinced, why?) Evolution is not dogma or religion, it is an all-encompassing theory that is constantly evolving within a set of very wide parameters.. It is getting more and more frightening out here. Like you i don’t want every American to suddenly become a Progressive, I would though like them to become intellectually coherent. 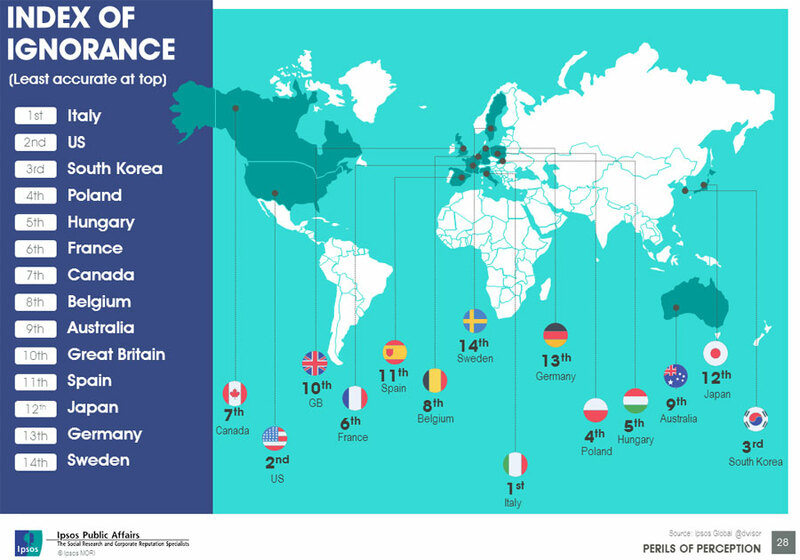 Is it time for twenty-first century Renaissance? Three steps forward, two steps back. Is this not the same country in which 50 years ago tomorrow, police freely killed Black Civil Rights marchers on the Edmund Pettus Bridge? Or is it? Did not the US majority twice vote into the highest office in the land, the first Black American President – (there had to be some Republicans voting for him too) only to have him politically “lynched” by the unevolved? Sometimes the pendulum swings so wildly we lose our bearings. I would add, the sickness in the modern Democratic Party is clearly battle fatigue. Democrats constantly playing Whack-a-Mole to the Republican agenda. Who wins? Rarely anyone.